WARNING: When I first saw the pictures that you’ll see below, I felt sick to my stomach. It wasn’t a physical sickness but a spiritual sense of such palpable evil that my soul felt ill. Whether you’re Christian or not — especially if you’re not a Christian — please bless yourself with the sign of the cross and say a prayer for God’s protection before you read further. I recommend the powerful Prayer to St. Michael, HERE. Please do it even if you don’t believe — if only just to humor a fruitcake, me. Anyone who’s been on the Internet cannot avoid coming across dark warnings about the Illuminati — a purported conspiratorial organization that acts as a shadowy “power behind the throne” or “the power that be” (TPTB), a modern incarnation or continuation of the Enlightenment-era Bavarian Illuminati, a secret society founded on May 1, 1776. It is said that the Illuminati are the masterminds who actually control world affairs through governments and corporations, eventuating in the establishment of a one-world government — the New World Order. The Rothschild family (known as The House of Rothschild, or more simply as the Rothschilds) is a European family of German [Ashkenazi] Jewish origin that established European banking and finance houses from the late eighteenth century. Five lines of the Austrian branch of the family were elevated into the Austrian nobility, being given hereditary baronies of the Habsburg Empire by Emperor Francis II in 1816. The British branch of the family was elevated into the British nobility at the request of Queen Victoria. It has been argued that during the 19th century, the family possessed by far the largest private fortune in the world, and by far the largest fortune in modern history. At this point you’re probably rolling your eyes and making the “ding-ding ding-ding ding-ding” Twilight Zone sound. Admittedly, while this mother of all conspiracy theories makes for interesting reading, I’d always retained my skepticism. For one, conspiracy theories by their very nature are difficult, if not impossible, to prove/verify or disconfirm –” It’s secret ’cause it’s a conspiracy!” If you ask a conspiracy theorist (CT), “If it’s such a conspiracy, then how do you know all this?”, the CT either says “I just know” or “Well, TPTB leak clues and leave hints of their plans because they are so arrogant and cocky.” If you bring up a counter-argument such as “But how do you account for there being these powerful wealthy groups that don’t agree with each other?,” the CT replies, “You see, there are contending factions within TPTB.” And so on and so forth. In other words, the CT is always right no matter what, which makes the Illuminati conspiracy theory air- and water-tight, impervious to counter-evidence or counter-arguments. The flawed epistemology of conspiracy theories such as the one about the Illuminati makes me all the more skeptical until I saw pictures of a Rothschild — the Baroness Philippine de Rothschild — in an article on Makow’s website. 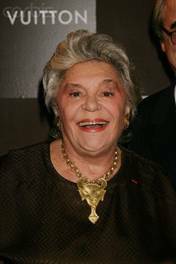 The Baroness Philippine Mathilde Camille de Rothschild (born Paris, France, 22 November 1933) is the only daughter of the vintner Baron Philippe de Rothschild, a member of the Rothschild banking dynasty and owner of the French winery Château Mouton Rothschild. Rothschild entered her father’s wine business in the late 1970s. When Philippe died in 1988, Philippine inherited three winery estates in Bordeaux. At the time of her father’s death, the company sold 1.3 million cases of wine a year. By 2000, sales had almost doubled to 2.1 million cases. In 1999, sales amounted to around $155 million. Her personal wealth has been estimated at €190 million by Le Nouvel Economiste. Below are photos of the Baroness. Note that in every picture she wears a heavy chainlinked gold necklace with a pendant. The pendant in the first pic below is a huge image of Baphomet, a pagan deity that, since the 19th century, has become a figure or synonym of Satan. Remember that this woman is one of the wealthiest people on Earth who can wear any piece of jewelry she desires, but again and again she chooses to wear these big ugly Satanic pendants on big, heavy, gold chain necklaces. I leave you to draw your own conclusions….